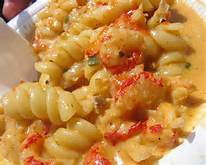 This New Orleans Style Dish Is Top Notch....Try It This Week For Quick Meal With A Green Salad. Melt butter in a Dutch oven over medium-high heat. Add onion and next 4 ingredients, then saute 5 minutes. Stir in flour and milk gradually stirring with a whisk. Add cheese and stir until cheese melts. Stir in craw fish, black pepper, salt and cayanne pepper. Cook until heated. Add pasta and toss it well.